For users of the Rotordynamics Module, COMSOL Multiphysics® version 5.3 brings an app for simulating a rotor bearing system, new functionality to the Hydrodynamic Bearing interface for modeling lubrication inside a bearing, and the modified Reynolds equation. Learn more about the Rotordynamics Module updates below. 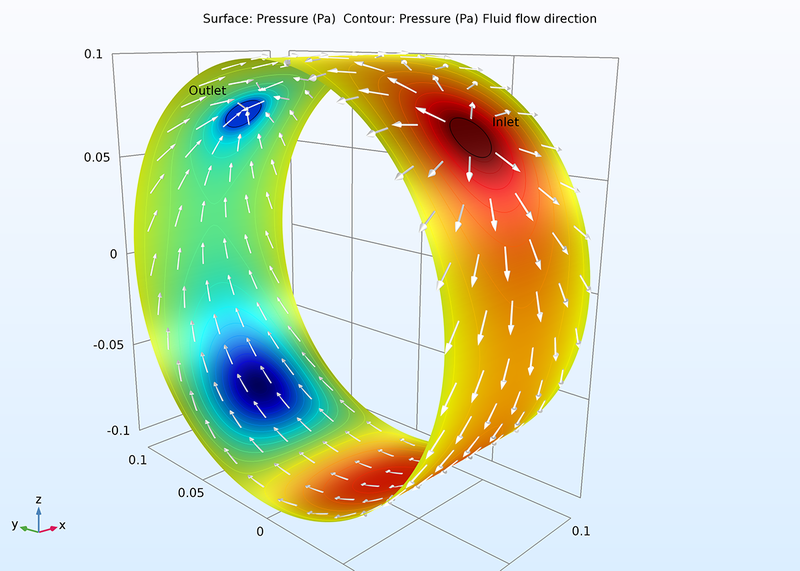 Inlet and Outlet boundary conditions for surfaces have now been added in the Hydrodynamic Bearing interface, thus making it possible to model situations where a lubricant is continually being supplied within a bearing. Pressure distribution and the direction of flow in a bearing with inflow and outflow pipes. Flow enters at the point of greatest pressure. Pressure distribution and the direction of flow in a bearing with inflow and outflow pipes. Flow enters at the point of greatest pressure. 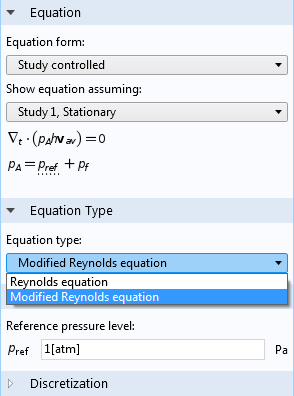 The modified Reynolds equation for modeling gas-lubricated bearings is now available in the Hydrodynamic Bearing interface. Further, viscous dissipation in the fluid film is now computed in this interface. This is useful when you want to compute the temperature distribution in a lubricant. The Rotor Bearing System Simulator is an example of an app that can be used to design and analyze rotor systems consisting of a rotor and different disks and bearings. It is useful for the preliminary design stage of rotating systems to ensure that the system's critical speed is not in the region of its operating speed. An eigenfrequency analysis of the system is performed by the app at different angular speeds to find the critical speed of the rotor. You can input the geometrical dimensions and stiffness of the rotor, position and inertial properties of the bearings and disks, and other material properties by choosing a predefined material from a drop-down menu. This can be done through manually specifying the data or uploading it from a file. The app automatically creates the geometry and sets up the physics based on the information provided in the inputs. The application uses the Beam Rotor interface. After computing the results, you can visualize Whirl and Campbell plots and review a table of critical speeds that are dependent on the input parameters. A report can be generated that includes the app setup and results through the click of a button. 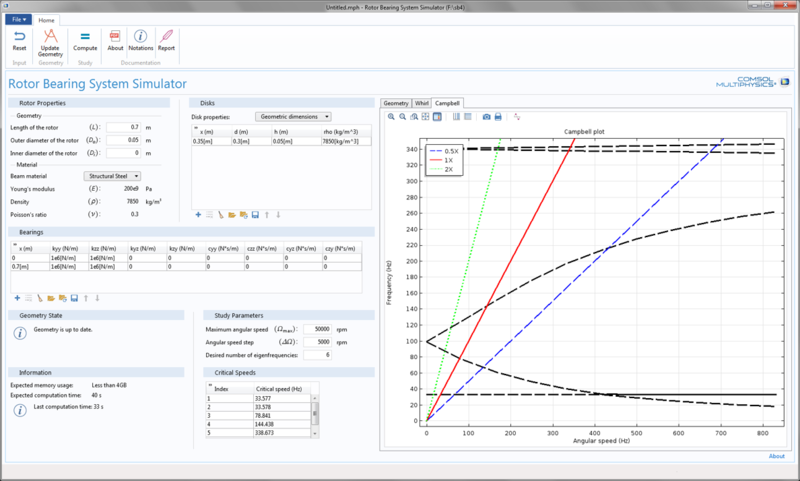 The user interface of the Rotor Bearing System Simulator app. Inputs include geometrical dimensions and material and operating conditions. Outputs include Campbell and Whirl plots and a table of critical speeds. The user interface of the Rotor Bearing System Simulator app. Inputs include geometrical dimensions and material and operating conditions. Outputs include Campbell and Whirl plots and a table of critical speeds.